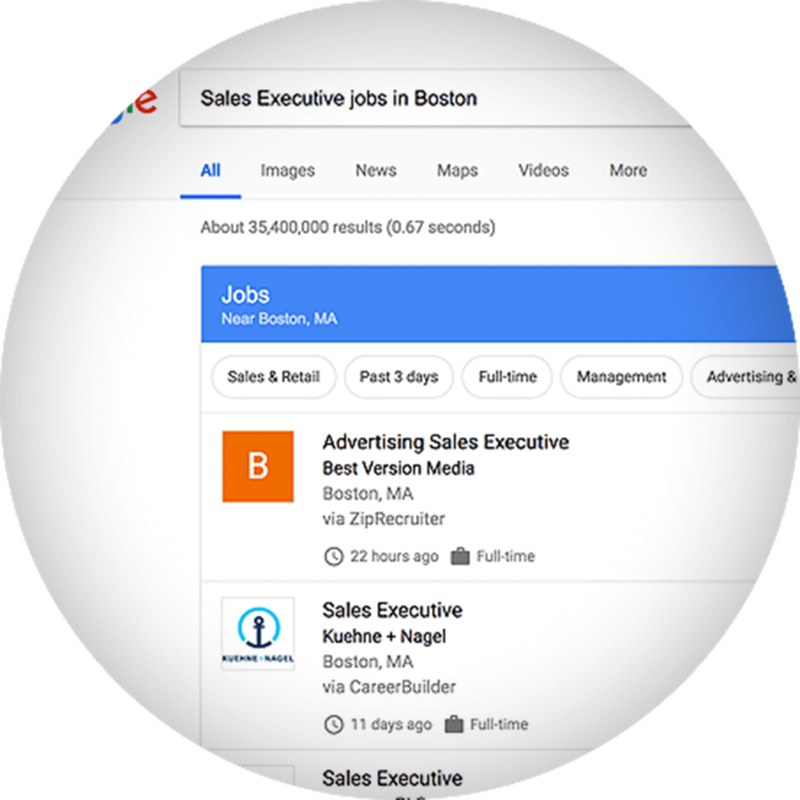 Google for Jobs matches job seekers with relevant, high-quality job listings by aggregating job listings from around the web and presenting job search results in a simple box at the top of the search results. Google provides limitless filtering capability to present the best job postings that closely match a job seekers requirements. This new channel creates a significant opportunity for recruiters to directly reach highly qualified applicants. Browse our FAQ to learn more about how Google for Jobs works. Jobiak scans your post and identifies the nine attributes that Google requires for Google for Jobs posts. We then transform those attributes into the required HTML and JSON schema tags. Even though this is a complex process behind the scenes, Jobiak has put a clean, user-friendly interface on the underlying technology to make it simple for you to post your jobs directly to Google for Jobs, without requiring developer support. Jobiak’s advanced Machine Learning tools are designed specifically for job postings, scouring millions of job descriptions to ensure a high degree of accuracy. Our tool has been trained to automatically recognize all of the key Google tag attributes including title, job location, job description, date posted, and hiring organization. You have the option to review those tags and make adjustments if necessary, and then with one click, publish your job. Read more about Jobiak’s machine learning algorithms here. Jobiak makes it so you don’t need to code, and you don’t need a developer. The structure of the tags that Google requires for successfully posting your jobs to Google for Jobs can be daunting, and typically would require a skilled HTML developer and access to the code on your website. Instead, Jobiak is the only no-code required Google for Jobs posting engine available on the market today. Simply upload your job description, review the tags we find for you, and then publish. It’s just that easy, no coding required. Google for Jobs is a new product from Google that matches job seekers with relevant, high-quality job listings. Google for Jobs aggregates job listings from around the web and presents job search results in a simple box at the top of the organic search results. Google aims to leverage the power of their search platform to deliver the best job postings to the best applicants through limitless filtering capability. For recruiters, this is a powerful new job listing engine that has the capacity to transform how job seekers find your jobs and to deliver you highly qualified applicants for your job postings. Does anyone actually use Google to search for Jobs? Don’t job seekers just go to a job board? While estimates range, it is clear that 100s of millions of job searches start on Google each month. And studies have shown that 73% of job seekers start their search on Google. Historically, the job boards would compete heavily for top placement for job searches through both organic and paid channels. Today, Google is presenting the Google for Jobs interface at the top of the search results to deliver highly relevant search results to job seekers. While searches still do occur directly on the job boards, there is a dramatic shift underway in how job seekers find jobs today. How can I tell if my jobs are showing up on Google for Jobs? Jobiak has created a Job Checker utility to help you determine if your job is currently available on Google for Jobs. Simply enter the URL of your job and we will determine if your job is posted on Google for Jobs. Check your jobs now! Why can’t I just post jobs to Google for Jobs myself? The complex schema that Google requires for your job to appear on Google for Jobs requires that you have a working knowledge of HTML and the JSON file format. You will also need a Google Index API account, and the expertise to work with the Google Index API. Lastly, you will need direct access to the underlying code on your job posting page to update the HTML with the required schema. Further, since each job is unique, you will need to go through this complex and time-consuming process for each job you post to your site. The technical knowledge, systems-level access, and time to perform these functions on each post are simply out of the reach of most recruiters and talent acquisition team members. Doesn’t my Applicant Tracking System (ATS) post my jobs to Google for Jobs like any other job board? A number ATS’ have done the work to forward your job posting to Google for Jobs. We have developed a comprehensive list of ATS’ that are integrated with Google for Jobs here. Keep in mind that some ATS’ declare that they are “integrated with Google for Jobs” however this is often an add-on service, or it requires special processing to ensure that your job does show up on Google for Jobs. To check to see if your job is currently on Google for Jobs, Jobiak has created a simple JobChkr tool, try it out here. 1. Certain ATS’ forward your jobs to Google for Jobs, but because your job is hosted on a landing page created by the ATS, Google for Jobs believes that job is associated with your ATS rather than from your brand. Instead of “Apply on [Brand]” Google for Jobs will show “Apply on [ATS Brand Name]. See an example of this below. 2. For many individual recruiters and talent acquisition managers, the posting process to the ATS is a black box and they have no control over what is sent to the job boards, or how the job shows up on Google for Jobs. Jobiak Business plan users take control over that process and are able to test the best job post language, as well as analyze the entire applicant funnel flow from the Jobiak dashboard. If I post my jobs to a job board, won’t the job show up on Google for Jobs? Yes, many job boards will pass their jobs to Google for Jobs (though as of this writing, Indeed is not integrated with Google for Jobs). In addition, many of the job aggregation sites that have sprung up to feed traffic to the major job boards are also integrated with Google for Jobs. This is an option if you are willing to one: pay to post all of your jobs to an integrated job board, and two if you are willing to allow the job boards to siphon away your best applicants. Google for Jobs treats every Apply option equally so now your prospective applicants have to choose where to go to apply and your website is not an option. [see example above] Once on the job board has pulled your best prospects to their site, they are going to maximize that click to display ads, potentially show other related jobs, and dilute your brand message. In addition, the job seeker experience degrades exponentially with each subsequent click and job seekers may never reach your careers page to learn more about what its like to work at your company. How many jobs can I post for free using Jobiak? Jobiak’s free offering enables recruiters to post up to 3 jobs for free. Should you like to post more jobs, Jobiak Pro users are able to have 6 job posts active at any one time. You can learn more about Jobiak’s pricing packages here. In addition, we run frequent promotions enabling you to earn additional free months of service or additional free job postings. Log in and check your dashboard to take advantage of these promotions. Is there any way to get more free months or more free jobs? Yes! We run frequent promotions enabling you to earn additional free months of service or additional free job postings. Log in and check your dashboard frequently to take advantage of these promotions. My job is currently posted on a job board, can I use that link with Jobiak? 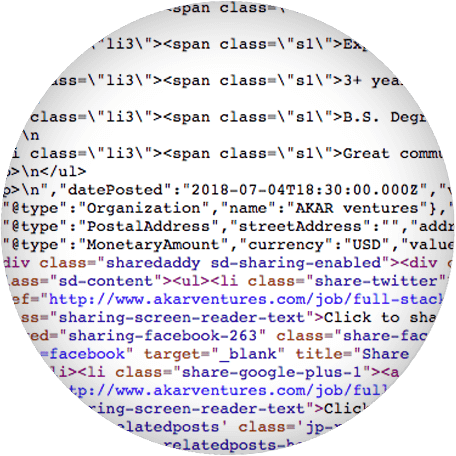 While many job boards allow our crawlers to access jobs posted to the board site, this is not the intended use case and would create the potential for a poor user experience. We strongly recommend using the native URL of your job post either on your website or hosted in your ATS. What do I do if I don’t have a URL for my Job Post? Currently, Free and Pro users must have a public URL that our engine can crawl. Business Plan users are able to connect directly to their ATS and pull jobs from the ATS. Soon, Jobiak will allow all users to upload a PDF of their job, we will announce more details as they are available. If your jobs are currently hosted in an ATS that does not create a permanent public URL, we are currently offering three months free for Business Plan users so you can try our integration for free. I have posted my job, where do I go to see it? If Jobiak is hosting your job for you, log in to your dashboard and all of your active jobs are displayed below the Job Analytics section. Simply click “view” in the individual job menu to see that job live on the Jobiak site. Business account users should simply navigate to the job on their careers page. Can I add my company’s logo to my job posting? Jobiak Pro users are able to view the job posting once published on our site and update their logo. Adding the logo once will ensure that it shows up on all future jobs. In addition, Pro users can navigate to the “Employer Defaults” section under settings on the Dashboard and upload their logo. This option is not available for Free users, however upgrading to Pro is easily done from the job posting process. Business account users post their jobs to their own careers site and their branding is maintained. What if I want my job to appear on my careers page? Jobiak Business and Enterprise users are able to capture the HTML with the structured data included and post the job back to their website. Alternatively, if you have deployed the Jobiak Tracking Tag on your Website we are able to do this for you automatically. Can I log in to Jobiak on my mobile device? Currently, Jobiak is only available on desktop browsers, which is how most recruiters post jobs today. Our engineers are hard at work developing a mobile version that delivers the full power of the Jobiak platform while taking advantage of the unique capabilities that a mobile device provides. Stay tuned for updates in the near future. Does Jobiak support other languages in addition to English? Jobiak has launched the platform with English support at this time, and are currently tuning the machine learning engine to support Spanish as well. As Google expands the languages Google for Jobs is available in, Jobiak will evaluate appropriate timing to launch in that language. I am a staffing agency, can I use Jobiak to post my client jobs and redirect the apply process back to my company site? We have special programs available for staffing agencies so please contact us to learn more specifically about how we support the unique needs of recruiters working at staffing agencies or working as independent recruiters. All of my jobs are currently posted to one page, can I still use Jobiak? Google for Jobs requires that the embedded tags are available within the code of the page that the job is posted on. If you have multiple jobs on a single page, even if separated by anchor tags, Google for Jobs will not read the individual jobs. However, when importing the job post URL into Jobiak users are then able to isolate out the specific individual job, set up the tags for that post, and then import into Jobiak to host as part of the tagging process. The end result will be a Jobiak-hosted job post, for the individual job you chose. Repeating this process for each job that is embedded on the page will work around this restriction from Google.